Gutenberg. People say it’s a page builder killer. And being that I’ve created my own page builder (Page Builder Sandwich – which is currently having a major rebuild btw), I’m obviously concerned. How will it impact my business? My competitors’ business? Will it kill all page builders? I don’t know. But if it does then I’m in big trouble. Last time I checked out Gutenberg, it was just a short demo and wasn’t available for download as a plugin. That was a long time ago, and I’ve been thinking that I need to check it out ASAP to see whether I should be worried or not. I don’t know much about the current progress of the project. From what I know and what people are saying, Gutenberg is the NEXT WordPress. These aren’t game-breaking issues though. These things CAN be fixed – and this is why Gutenberg is in a “beta plugin” form. I’m sure someone will address these issues before the release. In the end, I was able to write my article with Gutenberg. So I suppose I’ll just have to get used to having having my content split in blocks. But being that this is the NEXT WordPress, I’m not sure I like this better than TinyMCE. It’s certain that my next article won’t be written with Gutenberg. I was expecting Gutenberg to be a glorified version of the current editor… perhaps something like Medium’s editor. Here’s what the default content looked like. 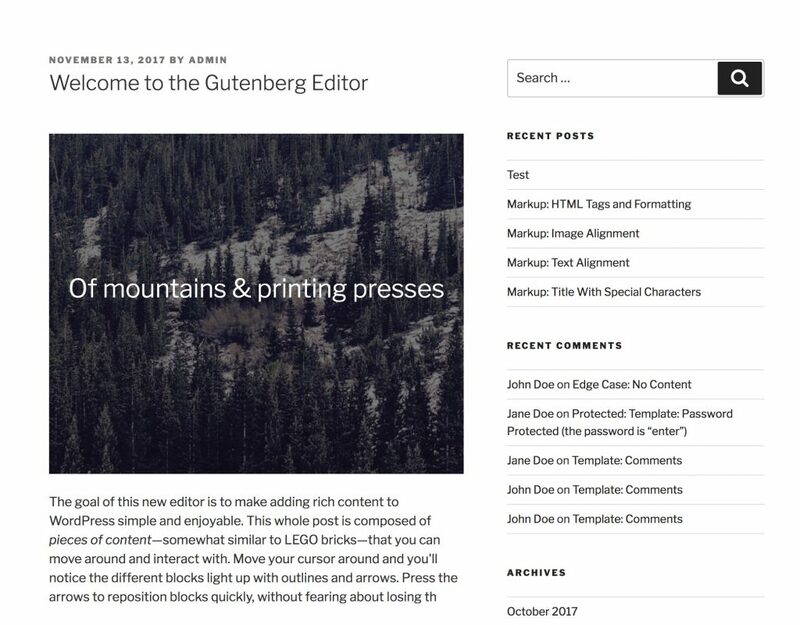 First impression of Gutenberg: It’s like a bare-bones backend page builder that plugins extend with blocks. One concern is that the writing experience feels hindered by the block system. It feels like Gutenberg was built as a page builder first, then as a tool to write content second. I think the writing experience needs to be fixed. I feel the way to go here is to have the editor be as smooth as Medium’s editor. To fix this, I think not everything should be in blocks. A block can just be any non-pure-text content (like images or shortcodes). Text can remain as normal paragraph text that I can type in easily and do whatever I can do with it right now with TinyMCE. If done this way, I could still highlight text as I would normally, and I can move text around and navigate using my arrow keys easily too. Since it’s all about blocks now, I think Gutenberg is also telling us to say goodbye to the Shortcode API. Moving forward, everything would now be blocks and developers should embrace the new Block API Although there are some discussions on shortcode support. I think the contributors are leaning away from shortcodes. Shortcodes would still “work”. They’ll be rendered in the frontend like always, but plugins/developers would need to convert their shortcodes into blocks if they want to stay relevant inside the editor. I guess the main goal is to become a site builder. Initially, I thought that Gutenberg was a glorified TinyMCE editor. But it isn’t. Gutenberg IS a page builder. Which means that new WordPress site installs or upgrades will have a built-in page builder in it. Developers can, and will create plugins that will provide 100 new blocks. Pair those with the new built-in Gutenberg page builder and that may render some of the tried and tested page builders and other plugins obsolete. It might even pave the way for WordPress to become a site builder. Will it kill page builders? Maybe. People had a reason to use page builders in WordPress pre-Gutenberg, primarily because is was hard to layout content. Post-Gutenberg, the only way people would still use a third-party page builder is if it gives them a new or good enough reason to. When will it kill page builders? Not any time soon. I don’t think Gutenberg is anywhere ready for prime time yet. Plus, it has a lot of things that need to be fixed (including the ones I mentioned above). The writing experience needs to be enhanced as well. Personally, I think that if they merge it into core and nothing’s compatible with the new block system yet, then people might go bonkers. Perhaps this would delay Gutenberg from arriving too quickly. It’s inevitable though, expect Gutenberg to be merged in the future and page builder plugins who aren’t ready to have a hard time coping. I guess the only way forward for me and Page Builder Sandwich is to innovate HARD and wish for the best. Gutenberg. People say it’s a page builder killer. And being that I’ve created my own page builder (Page Builder Sandwich – which is currently having a major rebuild btw), I’m obviously concerned. How will it impact my business? My competitors’ business? Will it kill all page builders? I don’t know. But if it does then I’m in big trouble. Last time I checked out Gutenberg, it was just a short demo and wasn’t available for download as a plugin. That was a long time ago, and I’ve been thinking that I need to check it out ASAP to see whether I should be worried or not. I don’t know much about the current progress of the project. From what I know and what people are saying, Gutenberg is the NEXT WordPress. 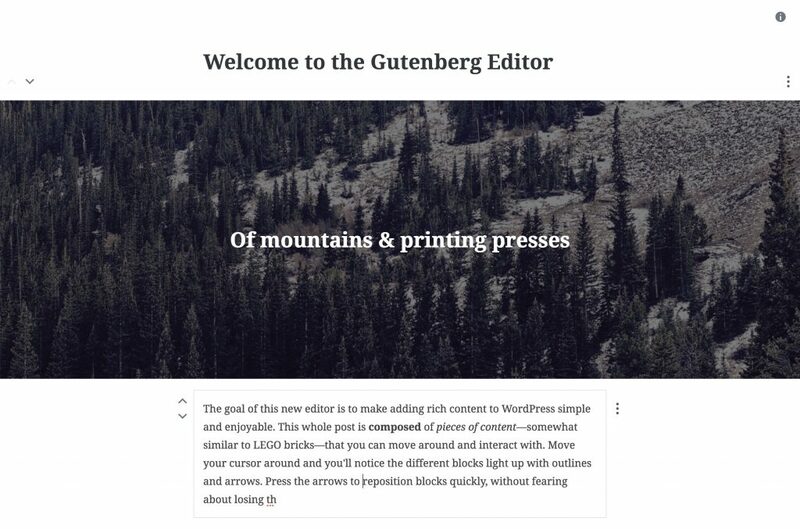 Initially, I thought that Gutenberg was a glorified TinyMCE editor. But it isn’t. Gutenberg IS a page builder. Which means that new WordPress site installs or upgrades will have a built-in page builder in it. Developers can, and will create plugins that will provide 100 new blocks. Pair those with the new built-in Gutenberg page builder and that may render some of the tried and tested page builders and other plugins obsolete. It might even pave the way for WordPress to become a site builder. Will it kill page builders? Maybe. People had a reason to use page builders in WordPress pre-Gutenberg, primarily because is was hard to layout content. Post-Gutenberg, the only way people would still use a third-party page builder is if it gives them a new or good enough reason to. When will it kill page builders? Not any time soon. I don’t think Gutenberg is anywhere ready for prime time yet. Plus, it has a lot of things that need to be fixed (including the ones I mentioned above). The writing experience needs to be enhanced as well. Personally, I think that if they merge it into core and nothing’s compatible with the new block system yet, then people might go bonkers. Perhaps this would delay Gutenberg from arriving too quickly. It’s inevitable though, expect Gutenberg to be merged in the future and page builder plugins who aren’t ready to have a hard time coping. I guess the only way forward for me and Page Builder Sandwich is to innovate HARD and wish for the best. Thoughts on creating “page templates” and “block collections” and being an early adopter/modifier of Gutenberg? If you do a search right now in the plugin directory for Gutenberg plugins, there aren’t any. This is a new niche that isn’t fulfilled yet, so business-wise it’s definitely a good idea to be first in there. I’m definitely thinking about being an early adopter and putting out a Gutenberg plugin. As for the timing, it all depends though on how final the API is. Gutenberg is in “super-active development” mode right now. There’re a lot of commits everyday: https://github.com/WordPress/gutenberg/commits/master and it’s changing constantly so putting out a plugin now might just make it prone to breakage. I’ll probably start something when it reaches a stable state.